The 11th annual Arty Party will be held Friday, April 17 at 6 p.m. at the Pavilion at Cypress Inn. From the April 2015 Desktop News | All-inclusive Caribbean getaways; collectibles autographed by Nick Saban and former Crimson Tide football starters; and priceless memorabilia from New York City’s famed Tavern on the Green restaurant are just a few of the one-of-a-kind items that will be auctioned at the 11th annual Arty Party fundraiser hosted by the Leadership Board in The University of Alabama’s College of Arts and Sciences. The event, “Cast Party,” will be held Friday, April 17 at 6 p.m. at The Pavilion at Cypress Inn on the Black Warrior River. All proceeds will benefit theatre scholarships in UA’s Department of Theatre and Dance. Ring of Fire features the music of Johnny Cash and will be the program’s 2015 SummerTide theatre production at the George Meyer Theatre in Gulf Shores this summer. 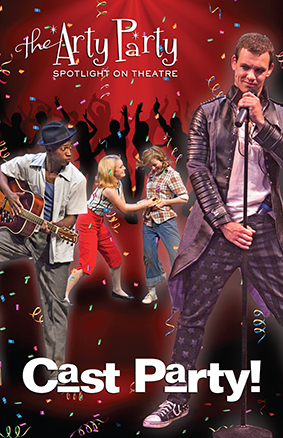 In addition to vacation packages and one-of-a-kind Crimson Tide memorabilia, the theatre program will auction a series of personalized packages including acting lessons and the opportunity to star in a UA mainstage theatre production; a personalized singing holiday or birthday gram; a “Dinner and the Theatre” package of season tickets to the 2015-2016 Gallaway Theatre with gift certificates for dinner at Cypress Inn; and more. Auction items were donated by Alabama businesses and individuals. The Arty Party is The University of Alabama’s most successful fundraiser for the fine and performing arts and has raised more than $280,000 in support of the five fine and performing arts programs at UA. The rapidly growing department of theatre and dance is home to more than 284 undergraduates, 42 graduate students and 21 full-time faculty members. The department offers courses leading to Bachelor of Arts degrees in theatre, dance and musical theatre. The program is the state’s most comprehensive, offering the only Master of Fine Arts degree in theatre in Alabama. The graduate program offers concentrations in acting, directing, scene design, lighting design, technical direction, costume design and production, and theatre management. Each year, the department produces nine full-length plays, four major dance performances and a number of short-form works. Individual tickets for the Arty Party may be purchased for $150, patron tickets for $200, table sponsorships for $1,250, benefactor sponsorships for $2,500, and underwriter sponsorships for $5,000. Patrons, table sponsors, benefactors and underwriters receive special gifts and recognition at the event. The Arty Party is sponsored by the College of Arts and Sciences’ Leadership Board and its Fine Arts Committee. The Committee is co-chaired by Camille Mendle and Paula Quarles of Tuscaloosa. Other members are Pam Askew, Bette Anne LeBlanc Bargeron, James S. Brooks, Melvin Butler, Naneita Leach Cobb, John R. Cranton, Jackie Brunson Crowell, Elizabeth B. Crump, Jerry D. Dillard, Jack Drake, Miller Bonner Engelhardt, Kathleen A. Farmer, H. Joseph Fritz, Milla Green, Patricia Hatcher Hall, Anne Barr Herman, Steven King, Stella Hillard Moore, Connie J. Morrow, Bruce Stanton Reid Sr., Martha Cobb Roberts, Ned Smith, Winifred L. Stakely, Donald Wilbur Stewart, Barbara Stone, Claire Tisdal, Rae Wade Trimmier, Mary Jean Weaver, Lucy Weinstein, Hoyt Winslett Jr. and Jeffrey Zieman. For more information and a complete list of auction items, visit the UA College of Arts and Sciences Arty Party website at www.artyparty.as.ua.edu. To purchase tickets or make a donation to the fundraiser, phone 205/348-8538.